Did you attend IMEX Frankfurt this year? Then I’m sure you are still recovering, just like me. What a fantastic event it was! Team Holland had the largest number of Dutch participants in IMEX history and each and every single one of them definitely rocked the floor. Let’s reminisce a bit! This means Team Holland twisted the exhibition floor more than ever, meeting old friends and making new. Whether you came to the Holland stand to network, plan one of your events, (re)connected with the Dutch over a glas of bubbles or Heineken during the renowned Holland Happy Hour or take a twisted photo with me, I hope you enjoyed the Orange Twist! Speaking of twisting, all you eventprofs attending IMEX Frankfurt definitely knew how to do the Orange Twist! Better hurry up though, voting/liking ends on May 5, 2016! The winner will be announced shortly after. What’s better than sleeping in a bit and enjoying an extended hotel breakfast to prepare for day two of IMEX? I’d say getting up at the break of dawn to run a 5k with about 800 other event professionals to get that heartrate up and running! It definitely helped to have a Brazilian breakfast including fresh coconuts calling your name at the finish line though. Kudos to Sports by TLC for getting everybody out and about at such an early time. Each year the IMEX Group presents the IMEX Academy Awards to individuals “who have served the meetings and incentive travel industry exceptionally well”. This year, Team Holland’s very own Eric Bakermans (Marketing Manager Meetings & Conventions at NBTC Holland Marketing) received the IMEX Academy Award Europe for his continuous contribution to the industry. Huge congratulations to Eric and well deserved. Team Holland is very proud! On behalf of Team Holland I’d like to say thank you to each and every one of you for visiting the Holland stand and making IMEX Frankfurt 2016 an unforgettable experience. Keep on twisting and see you in… Holland?! Group presentation at the Holland stand are fun! 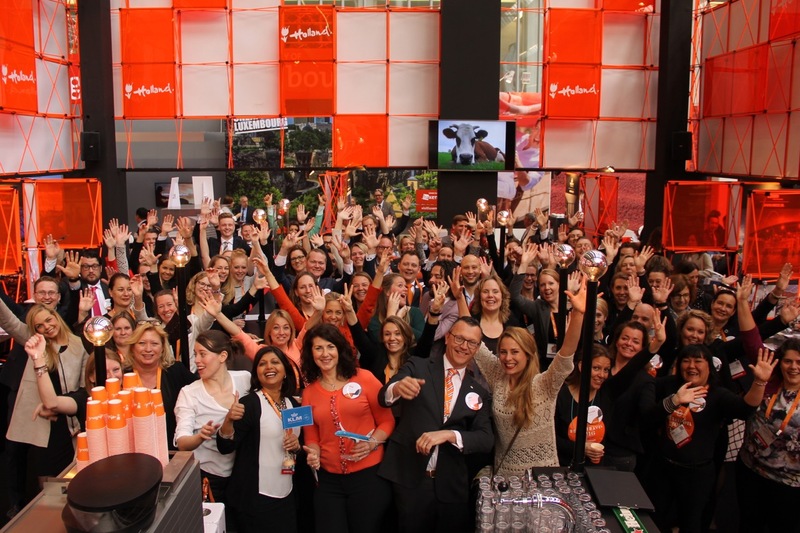 Missed Team Holland at IMEX Frankfurt? No worries. in 2016 you can still meet us at The Meetings Show UK in London, IMEX America in Las Vegas or IBTM World in Barcelona. This entry was posted in Columns, Uncategorized and tagged events, IMEX, IMEX Frankfurt, Meet Mr. Holland, meeting, Meeting planners, meetings industry, networking, Orange Twist by The Artist Formerly Known As Meet Mr Holland. Bookmark the permalink.